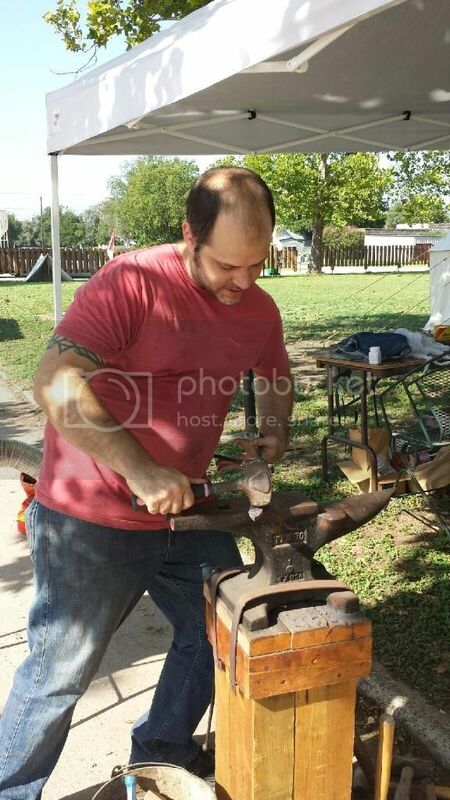 About to leave to go set up a forge and tent for a cowboy expo tomorrow. I'll be working a forge in 100 degree heat for about nine hours tomorrow, so wish me luck. I'll try to get my friend to take some of me while I'm working, but he's going to be talking to customers and trying to make sales. I'll do my best though. You need to use photobucket or something like that to share pictures on the forums. There we go. 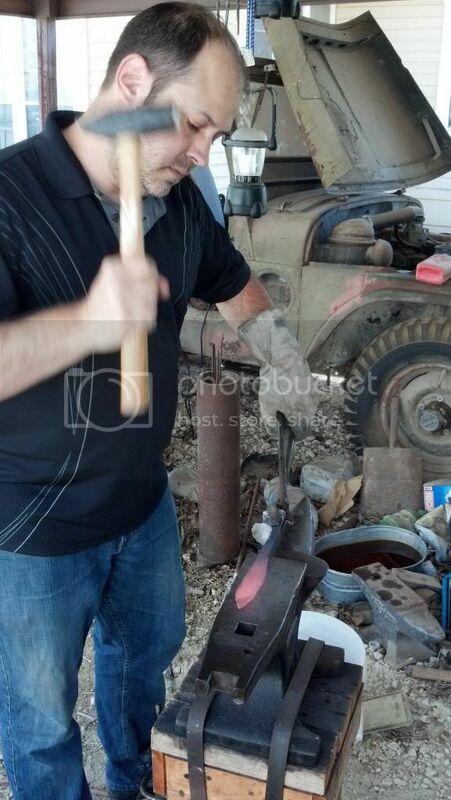 A couple of me making a knife awhile back. I'll see if I can get some more while I'm gone. Headed out now, see you all in a couple days. Good luck! 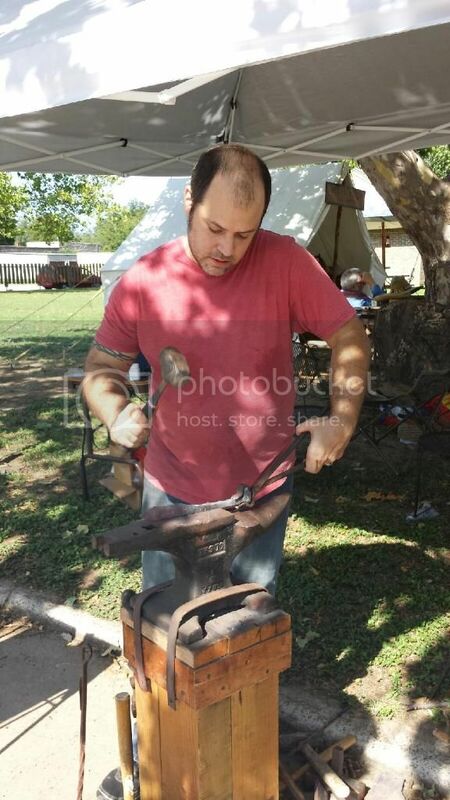 Miss being acquainted with the blacksmiths when I was involved with the horse world, long, long ago. Hope it goes well for you! 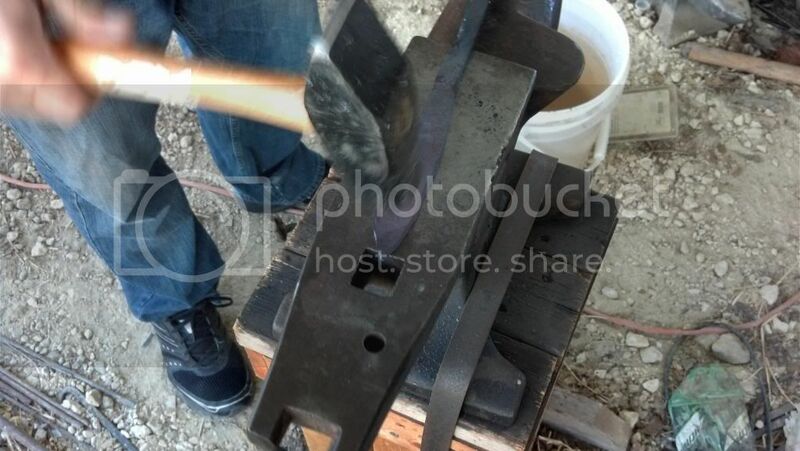 MrDvAnt wrote: About to leave to go set up a forge and tent for a cowboy expo tomorrow. I'll be working a forge in 100 degree heat for about nine hours tomorrow, so wish me luck. Which one? Im also in the land of rootin, tootin, pointin and shootin Texans. Been asked to do a 6 month work placement on a ranch just outside of Austin... I think. It's in Hico. National Cowboy Day I think it's called. Set up the tent today and we're right next to the chuck wagon. Gonna be a good day. Hico, where everybody is somebody. Sounds pleasant, good luck to you cowpoke. Hawkwind wrote: Hico, where everybody is somebody. Sounds pleasant, good luck to you cowpoke. 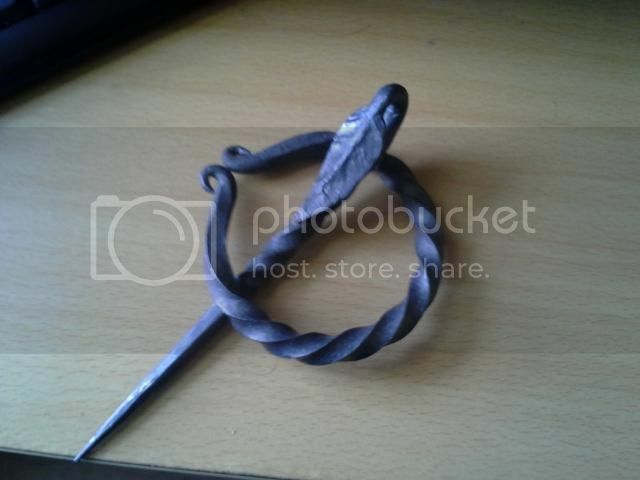 Cloak pin that I made. Hard to see kinda of, but the pin is folded over and has a leaf design on the head. How long does something like that take to make? The pin takes about 20-30 minutes. It's pretty easy. Not to downplay my mad skillz or anything, but you might be surprised by how little practice this actually takes. Probably only about 30 minutes of explanation and demonstration and a certain level of ability with working with your hands for simple stuff like this. Iron is pretty forgiving. You pound it, you mess up, you pound it some more. As long as you don't crack it or anything, you're good.